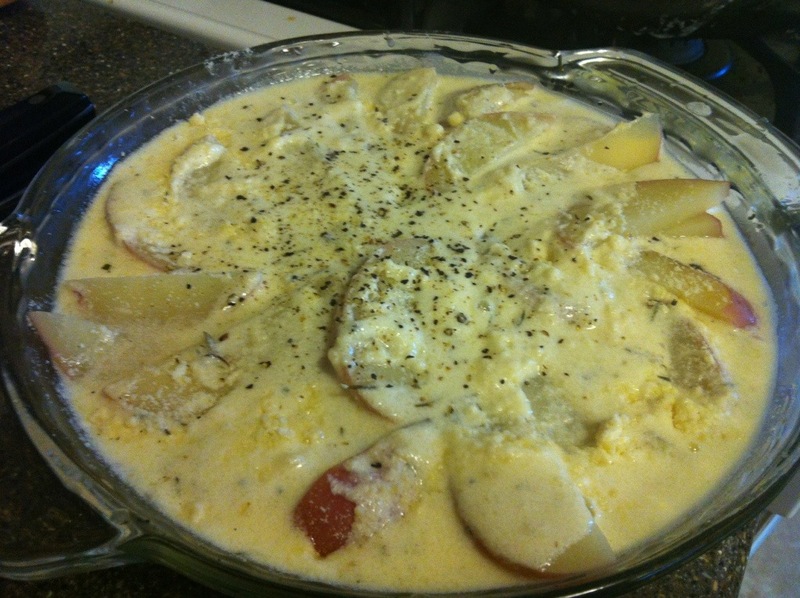 Every now and then, I like to make something cheesy and comforting yet without all the calories. 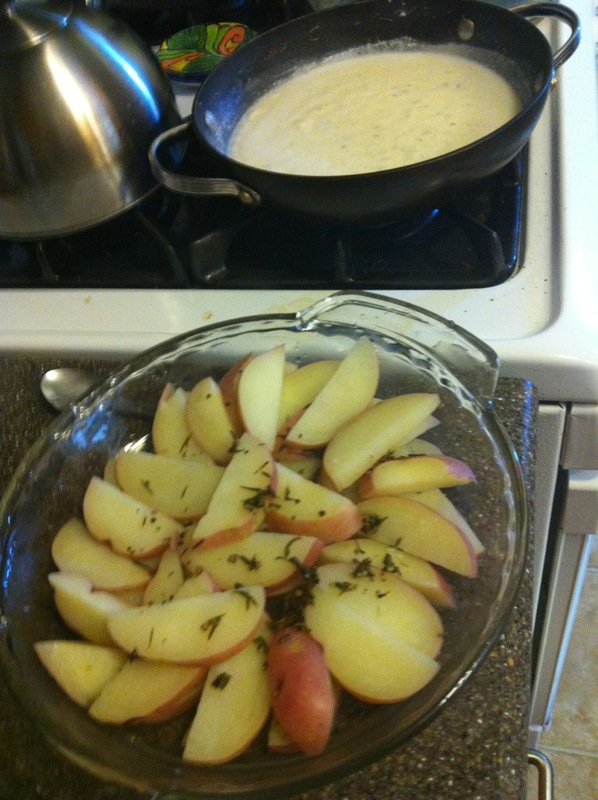 I started making this “skinny sauce” and like to use it for my Au Gratin and Macaroni and Cheese. I made 4 portions in this pie pan and calculated it as 175 calories per portion. Slice Potatoes into wedges. For 4 portions, I sliced 2 medium to large red potatoes. I boiled them in about 3 cups of water with the savory, salt and pepper. Cooked to about 8 minutes, cooked through yet not mushy. I drain the water from the potatoes, yet keep a little. Like 1/4 cup of the herbed water. Then I make the sauce in the drained pan. Heat butter in pan, add water and milk. Let boil and add salt. Add Cream Cheese and Yogurt or Sour Cream and break down with a fork. Let boil for 3 minutes or so and add Parmesan as you stir and thicken the sauce. Heat Oven to 375 degrees. Arrange your Potatoes in a Pie pan. I like to save some of the herbs from the water. 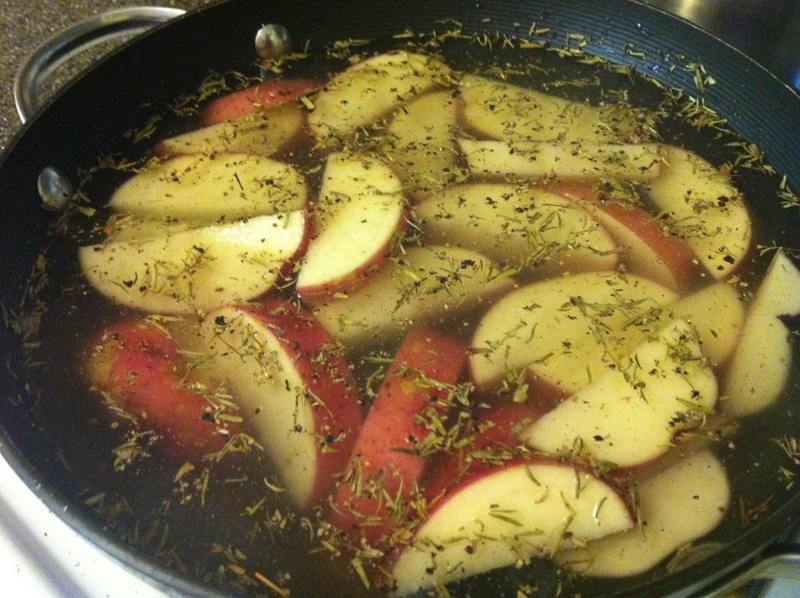 Pour Sauce over Potatoes in Pan. Sprinkle a little more Parmesan and cracked pepper or cayenne. Bake for 20 minutes, then turn on high broil for 5 minutes or raise heat to 400 to crisp the top.